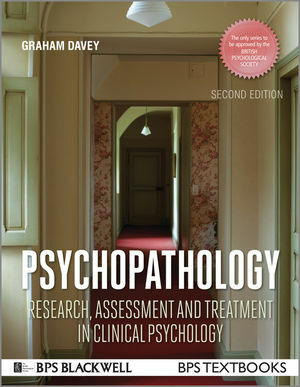 Psychopathology has been designed to provide students with a comprehensive coverage of both psychopathology and clinical practice, including extensive treatment techniques for a range of mental health issues. The text is designed to be accessible to students at a range of different learning levels, from first year undergraduates to post-graduate researchers and those undergoing clinical training. Psychopathology is primarily evidence and research based, with coverage of relevant research from as recently as 2013, making it useful to researchers as well as clinicians. The emphasis in the book is on providing students with a real insight into the nature and experience of mental health problems, both through the written coverage and by providing a range of video material covering personal accounts of mental health problems. The text is integrated with a wide variety of teaching and learning features that will enable facilitators to teach more effectively, and students to learn more comprehensively. Many of these features have been updated for the new edition and new material has been included to reflect the changes in DSM-5. Features include Focus Points that discuss contentious or topical issues in detail, Research Methods boxes showing how clinical psychologists do research on psychopathology, and Case Histories detailing a range of mental health problems. An all new student website is available at www.wiley-psychopathology.com. The website houses a huge variety of new digital material including more than 50 instructional and supplementary videos covering descriptions of symptoms and aetiologies, examples of diagnosis and diagnostic interviews, recounted personal experiences of people with mental health problems, and discussions and examples of treatment. The site also contains hundreds of new student quizzes, as well as revision flashcards, student learning activities, discussion topics, lists of relevant journal articles (many of which provide free links to relevant articles published in Wiley Blackwell journals), and topics for discussion related to clinical research and clinical practice. A fully updated lecturer test bank has also been developed including over 1,000 questions, as well as suggested essay questions and these can be accessed by instructors on our lecturer book companion site. Graham C. L. Davey, Ph.D. is Professor of Psychology at the University of Sussex, UK. Professor Davey has published over 140 articles in scientific and professional journals and written or edited 16 books including Psychopathology; Clinical Psychology; Applied Psychology; Complete Psychology; Worrying & Psychological Disorders; and Phobias: A Handbook of Theory, Research & Treatment. He has served as President of the British Psychological Society, and is currently Editor-in-Chief of Journal of Experimental Psychopathology and Psychopathology Review. In the disorder chapters, discussions of bipolar disorder, deliberate self-harm, and psychosis-related phenomena and cognitive decision-making processes have all been expanded. In additional, the most recent research on genetics, epigenetics and neuroscience has been included, along with some explanatory sections in chapter 1 that describe these types of explanation to the reader. In each of the disorder chapters there are three main themes: description and diagnosis, aetiology and causes, and treatment. In the treatment section students are provided with a real insight into how treatments work in practice by providing detailed examples of the ways in which therapies are constructed and delivered. Includes full coverage of DSM-5 diagnostic criteria and their implications. An entirely new chapter on Clinical Practice, covering the roles of mental health professionals, service provision, and the role and training of clinical psychologists. The text is accessible for students at a range of different learning levels, from first year undergraduates to post-graduate researchers and those undergoing clinical training. Evidence and research based, with coverage of relevant research from 2013. Fully updated lecturer test bank with over 1,000 questions, as well as hundreds of new student quizzes and suggested essay questions.